Just off Whitehall, in London’s SW1 postcode, fronted by one of the world’s most iconic front doors, stands Number 10 Downing Street, the unique home and office of the British Prime Minister. Dating from the late seventeenth century, this historic building has been the scene of hundreds of years of political decision-making at the highest level. Despite its central role at the heart of British government, Number 10 Downing Street was not designed for its current purpose. Constructed initially by controversial former diplomat Sir George Downing, a man famously described by his clerk Samuel Pepys as ‘a perfidious rogue’, the house was built cheaply on marshy land before being given to the First Lord of the Treasury Sir Robert Walpole by King George II in 1735. Winston Churchill described the houses at Downing Street as ‘shaky and lightly built by the profiteering contractor whose name they bear’. Initially consisting of two buildings knocked together, Number 10 has had to be constantly adapted to keep up with the changing role and needs of its primary occupant. Incremental reconstruction, remodelling and renovation works have managed to keep No.10 functioning, but at many important points in Britain’s political history, the building has come close to falling apart at the seams. Despite the challenges presented by such an historic home and office, the famous Downing Street houses of the 1600s remain a surprisingly successful centre of British governance. The story of Number 10 Downing Street is intimately intertwined with that of its occupants. The interaction between the changing face of the building and the many faces that have occupied it is both fascinating and extremely revealing of both personalities and their approaches to occupying the office of Prime Minister. It is for this reason that I will be spending the next year researching and writing on this subject. My name is Jack Brown and I have the honour of being the first Researcher in Residence at Number 10 Downing Street. I work for the Policy Institute at King’s, where I was appointed a Visiting Research Fellow in 2014, and am in the ‘writing up’ stages of a Queen Mary, University of London PhD on the contemporary political history of the emergence of Canary Wharf and the regeneration of London’s Docklands. I have lived in north east London all my life, and studied Contemporary British History throughout my university career. I am tremendously excited to be undertaking this year’s research as the first historian to hold the title of ‘Researcher in Residence’ in the role’s inaugural year. The position of Researcher in Residence is the product of a unique collaboration between Number 10, the Policy Institute at King’s College London, the Widening Participation Department at King’s, the charitable organisation the Brilliant Club and Hewlett Packard Enterprise. Dr Jon Davis, now the Director of Partnerships of the Policy Institute at King’s, has been developing strong links between academia, government and business for over a decade, with a focus on improving student experience and simultaneously assisting government departments with recording and retaining their own corporate memory. The relationship between the Policy Institute at King’s and Number 10 has also seen the production of Margaret Thatcher & Number 10, the latest in a series of contemporary history projects and collaborations that seek to open up the history of Downing Street and its occupants to the public and academics alike. The institutional partnership that is emerging will include a new postgraduate module ‘Number 10 Downing Street & the History of the Prime Minister since 1945’ and a 10-years-long comprehensive history of the office of Prime Minister since 1945. The Brilliant Club is an award-winning charity that seeks to widen access to highly-selective universities for pupils from under-represented groups, primarily by placing current PhD researchers into non-selective state schools across the country. The Brilliant Club’s involvement in this project will see the Researcher in Residence’s findings developed into a unique syllabus on the history of Number 10 that will be taught to primary school and sixth form pupils this year, and will also be part of a growing library of courses taught around the country in non-selective state schools. The post of Researcher in Residence runs for a year at a time – so time is of the essence! The Researcher has been granted unprecedented – but not unrestricted - access to ‘people and papers’, in order to investigate and record Number 10’s postwar history for future generations of both practitioners and observers. A series of blogs and updates on the progression of the research will be published throughout the year. The finished product – a substantial written inquiry into the postwar ‘Geography of Power’ at Number 10 that will be made available to both policymakers and the general public - will be ready by the end of 2016. The aims of this project are threefold: to help Number 10 record and preserve its history and retain its ‘corporate memory’ into the future; to further open up Downing Street and its inner workings to the public; and to use the research produced this year to develop a course designed to teach children in non-selective state schools about what goes on behind that famous black door, bringing the history of Downing Street to life and encouraging interest and involvement in politics. This year’s research will investigate the ‘Geography of Power’ of Number 10 Downing Street between 1945 and 1997 - the postwar history of the ‘residence’ itself, and how it has influenced, and been influenced by, those who have occupied it. This period saw several significant changes in both the building and its occupants, including one of the most significant remodellings in the building’s history, orchestrated by architect Raymond Erith, during which Prime Minister Harold Macmillan temporarily decamped to Admiralty House. The central issue that this project seeks to investigate is how the period’s ten different Prime Ministers used the building’s rooms and facilities in order to best execute their job. How and why have they stamped their personalities and approaches to their role upon the building? Who have they wanted to keep closest in their day-to-day work – and is physical proximity to the Prime Minister the most important indicator of a civil servant or adviser’s power or influence? How did different Prime Ministers alter the building, and to what purpose? Were they able to shape their home and office to suit their needs, or did the historic building constrain their ability to perform their role? Additionally, this project will shed light on the working lives of the increasing number of people who have worked at Number 10. Today, the building is home to the Prime Minister and his family, but also a place of work for over two hundred people. At the time of its initial design, it was intended as little more than a place of residence. Now, due to the changing role of the Prime Minister, as well technological change and the increasing role of the media, it is also a hive of communication, decision-making, policymaking, negotiation and the entertainment of visitors from around the world. The role of Researcher in Residence is one small part of a wider move to open up this hive of activity to the world and preserve its fascinating history. 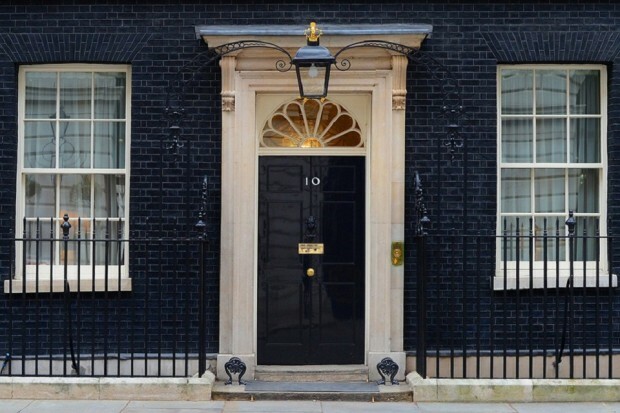 Is there any chance that you could exert some influence on getting the '0' in the number '10' on the front door of Downing Street properly aligned? For some time now it has been skewed to the left. My late mother who must have taught the Prime Minister art at her secondary school (Holton Park Grammar Schol for Girls/Wheatley Park Comprehensive School) would have thoroughly disapproved of the present situation. If you cannot help me direct perhaps you could forward this message to an official concerned with Downing Street building maintenance or send me a contact address. A spirit level and a screw driver would do the job in seconds. Thanks for your comment Tom - my contact at No. 10 tells me that the number 10 is not straight as it’s based on the original door on which the number was badly fixed or specially designed – no one quite knows – but it’s left that way as a nod to history.